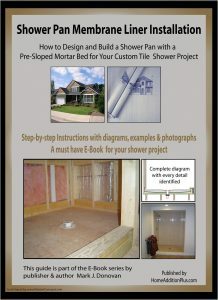 In this video Mark Donovan of HomeAdditionPlus.com reviews the stack up required in a mortar shower pan installation project. 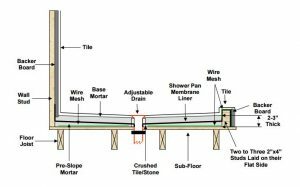 As part of a mortar shower pan install, there should be a solid floor base, followed by the placement of wire mesh on the base subfloor, then the installation of a mortar pre-slope, then the shower pan membrane liner, and lastly, followed by a final base mortar layer. Then the tile can be installed onto the final mortar base layer. Frequently I get people who contact me explaining their shower has a leak, and that the mortar shower pan was to blame. Often they tell me horror stories on how the mortar shower pan was installed. One of the most common problems I hear is that the mortar shower pan installer did not put a pre-slope in. This is a huge mistake in the event the shower pan membrane liner does spring a leak or becomes compromised in some way. The pre-slope mortar layer is the last defense in a failed shower pan for ensuring that water drains to the shower drain. Without it, water will end up sitting underneath the tiled shower floor and slowly degrade both the shower pan and the subflooring below it. And if there is a finished room underneath the shower, then water damage to the lower level is inevitable. By following the mortar shower pan stack up in this drawing you can be assured of a leak free shower pan. I have never experienced a failed shower pan from installing one this way. Note that it is important to place pea stone around the adjustable shower drain prior to pouring the mortar into the shower pan area. The pea stones prevent the small holes in the adjustable drain assembly from becoming clogged with the mortar when it is poured. 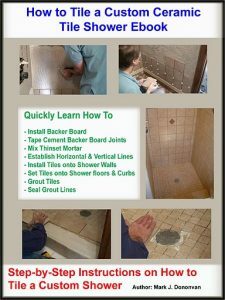 This mortar shower pan installation stack up works for both a shower pan being installed on a wood subfloor or concrete slab. Note that on a wood subfloor, the subfloor should consist of the original ¾ inch tongue and grooved sheathing followed by at least ¼ inch thick plywood on top, and preferably ½ inch thick. This will help to ensure negligible deflection in the subfloor. 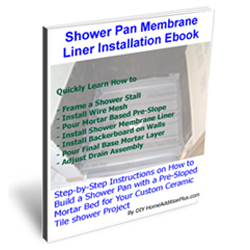 See my “Shower Pan Installation” Ebook to learn how to install a mortar shower pan: For a detailed set of instructions on building a shower pan, including pictures and a detailed cross-sectional view of the make-up of a shower pan, see my “Shower Pan Membrane Liner Ebook”.